James Michael Fisher of Linn Creek, Missouri, formerly of Scotts Bluff, Nebraska, was born July 5, 1942. He was the son of Paul and Mary Dolores Mayberry Fisher. He passed away peacefully on September 13, 2018 surrounded by his family at Lake Regional Hospital, Osage Beach, Missouri, at the age of Seventy six years, one month, and fourteen days. He was preceded in death by his father Paul Edward Fisher and mother Mary Dolores Mayberry Fisher. He is survived by his wife Carla (Charlton) Fisher of the home. During his marriage to Audrey (Wilson) Fisher two daughters were born, Shelly Fisher Mitchell and husband of Colorado and Terry Fisher Edens and husband Paul of Scotts Bluff. Two brothers Pat Fisher of Canton, Texas, and Jerry Fisher and wife Lynn of Canton, Texas. One grandson Brent Tremling and wife Annie of Wyoming, two granddaughters, Sunny Edens and Charlie Edens of Scotts Bluff. One great granddaughter Eva Tremling of Wyoming. There were no children born during his second marriage, but he had stepson Martin Burns and wife Jennifer of Kaiser, Missouri, two step daughters, Lisa Burns of Johnson Co., Missouri, Jessica English and significant other Kyle Rockers of Linn Creek, Missouri. Step grandchildren, Michael Burns, Julia Burns, Austin Stark, Sara Burns, Drew Vanhook, Dalton Burns, Will Vanhook, Kaylee Burns, Olivia Burns, Jake Hall, Courtney Hall and Natalie Hall. Step great granddaughters, Brandi Burns, Ava Gardner and soon to be great grandson Waylon William Henderson. He was an auto mechanic teacher in Torrington, Wyoming. He owned Leggs Groceries in Mack's Creek and was the manager of Tools and More in Osage Beach, Missouri. 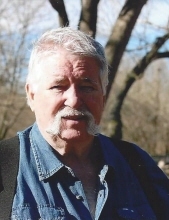 He was avid outdoorsman, he enjoyed fishing, going ice fishing, and custom fishing poles. He used to go duck and geese hunting prior to his life with Carla. He was man of many interest and one of them being electronics. James and Carla planned on traveling when they retired. Jim was a loving husband, father, brother, grandfather, great grandfather, and papa. He will be missed by all. To send flowers or a remembrance gift to the family of James Fisher, please visit our Tribute Store. "Email Address" would like to share the life celebration of James Fisher. Click on the "link" to go to share a favorite memory or leave a condolence message for the family.